Also called Methenamine, Hexamine is most commonly used as a solid fuel tablet used for cooking while camping or hiking. Compressed tablets of it are ignited and known as "heat pellets". In pyrotechnics, it is general purpose fuel used in some blue Star formulas and heat generating compositions. 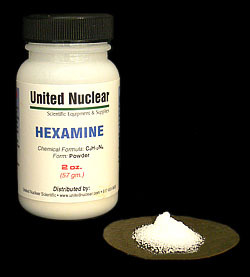 Hexamine is also the basis of some high explosive compositions.